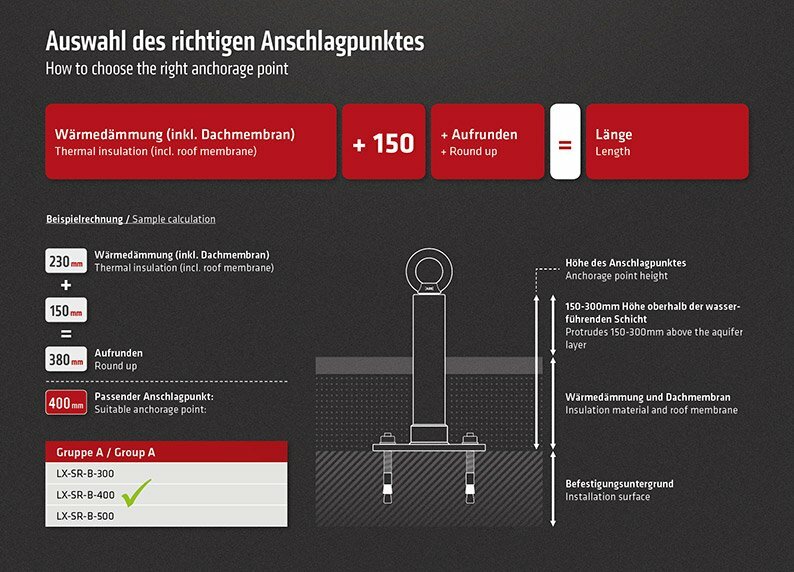 Below, please find an illustrative diagram which shows you how to calculate the right ABS anchor rod length. Simply print out this document or download the image in PDF format. Of course, we would be more than happy to provide you with any assistance or support you may need in connection with your fall arrest questions and concerns. Our team of specialists is ready and waiting to help you. Our Product Finder, which includes numerous filtering and search options, is also available online. Use this tool to quickly find all the information you need on any of our ABS Safety products. This information ranges from technical specifications and DIN certificates to complete installation instructions. 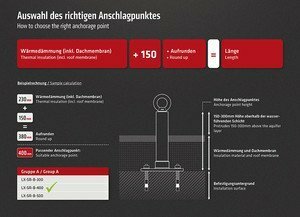 All our ABS Safety anchorage points comply with the very latest standards, such as EN 795 and CEN/TS 16415:2013, and are certified accordingly. The respective certificates contain information on the DIN standards etc. used to test and certify our products. Use for questions how to easily find the right ABS anchorage point the contact form, arrange a call-back appointment or simply give us a quick call.